There are those who have questioned the quality of the legal advice that Ty Cobb has been providing to President Trump and as this video shows there does seem to be some validity to those concerns. Mueller will never be fair or objective in any regard. He’s going to do everything he can to trap President Trump so that criminal charges can be filed and he can be impeached. That is Mueller’s goal. There’s nothing objective in their witch hunt and no crime to be investigated. The interview is all about a fishing trip and if he follows Cobb Trump would be jumping into Mueller’s bass boat. 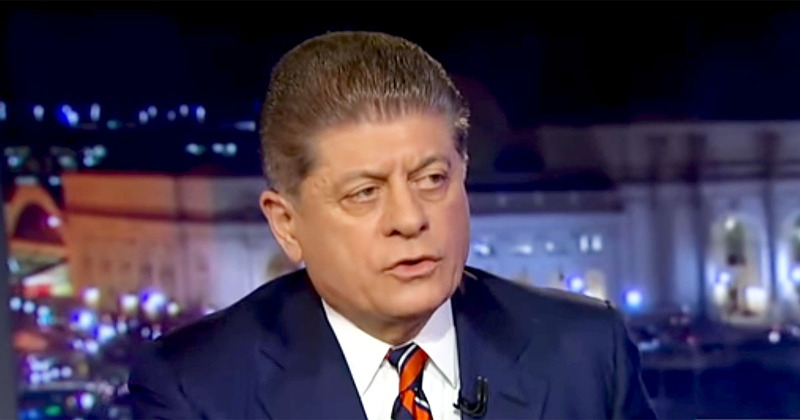 He adds, “It’s a recipe for disaster.” Napolitano seems to be providing more impassioned and better advice for free than the dufus with the silly looking mustache is providing for a hefty fee. the President is getting BAD ADVICE HE SHOULD NOT MEET WITH MUELLER OR ANYONES ELSE. he NEEDS TO FIRE THIS COMMUNIST SOB AND END THIS ONCE AND FOR ALL. and we NEED A REAL AG NOT SESSIONS. Trump should meet with Mueller and at meeting Trump should hand Mueller a letter that reads; YOUR FIRED. Right Skunk, for starters, then he should take a stack to DOJ and FBI headquarters. I believe Kelly will cause the interview to be conducted in writing, if at all.